Within a few weeks from the declaration of war with Germany in September 1939, George Digby married Violet Willden at Camberwell Register Office on the 25th October. The marriage certificate above shows that George and Violet were living at 45 Loncroft Road SE5, which was Violet's family home. George's peacetime occupation was commercial clerk, but as this was now wartime his military details are listed. 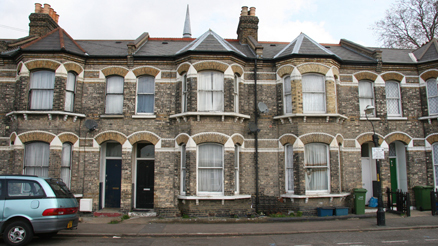 The two photographs directly below show the family home in Loncroft Road present day. 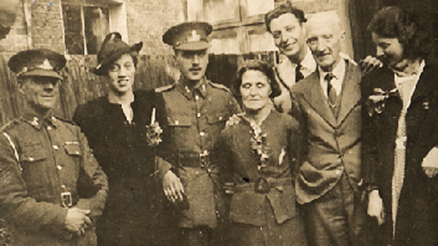 The wedding day group shows the best man (unknown army friend of George), Violet and George, George's mother Lilly and father Arthur. Behind them George's brother Herbert (Sam) and sister Joyce. During the war their home in Loncroft Road was damaged by bombing. This resulted in Violet moving home several times whilst her husband was overseas. 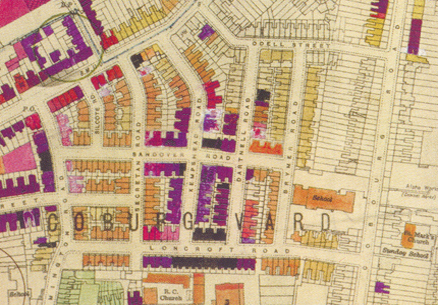 After the War the Digbys moved to 40 Revelon Road Brockley, just two doors away from George's aunt Adelaide. Loncroft Road was so severly bomb damaged during the War that most of the housing was destroyed. Luckily a section of terraced housind at the north eastern end of the road survivied which included the Willden family home at number 45. The 1946 bomb damage map below (left) and a present day aerial map (right) show the dramatic changes to the area over the last 50 years. 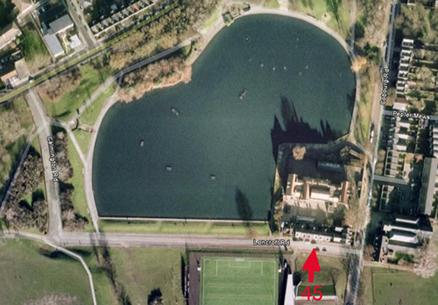 The school still survives behind the Willeden's home but a large artificial lake and parkland has been created where many of the prewar streets were. This area is now known as Burgess Park.